It’s so easy to badmouth the spin-off show to cable TV’s highest-rated show. Trash talk the writing, the directing and the acting all you want. They’ve all been pretty bad up to this point. While true, it’s also lazy. If you refuse to give Fear‘s Season 3 a chance, the joke’s simply on you. Somewhere between the season premiere and the mid-season finale, everyone involved with the show’s production upped their game. Of all the episodes that could have really impressed the public, it all began with Episode 4, “100,” which was primarily focused on Strand’s adventures in Mexico, while he was away from the rest of the group. The entire episode was drenched with intrigue (and subtitles), as practically the whole episode is spoken in Spanish. This episode truly felt like watching a foreign movie, in all the good ways. You had to pay close attention to be able to read what was happening, while also seeing it unfold on the screen. The writing, the acting and especially the direction were all on point. While one episode cannot erase two seasons and change from the mythology, it did an incredible job to promise something different, something unexpected and some hope for future episodes. The following episode, “Burning in Water, Drowning in Flame,” while not quite a home run, felt more like a triple. As more of the season unfolded for our protagonists, more of the main characters were killed off the show (RIP Travis Manawa), while a fan favorite returned from what seemed like his burning demise. Welcome back, Daniel Salazar! Bringing back this character was the absolute smartest storyline the showrunner could have made. But bringing back Ofelia… as a double agent? While we didn’t foreshadow that one, her return felt anticlimactic. So, what’s the situation outlook for the characters? 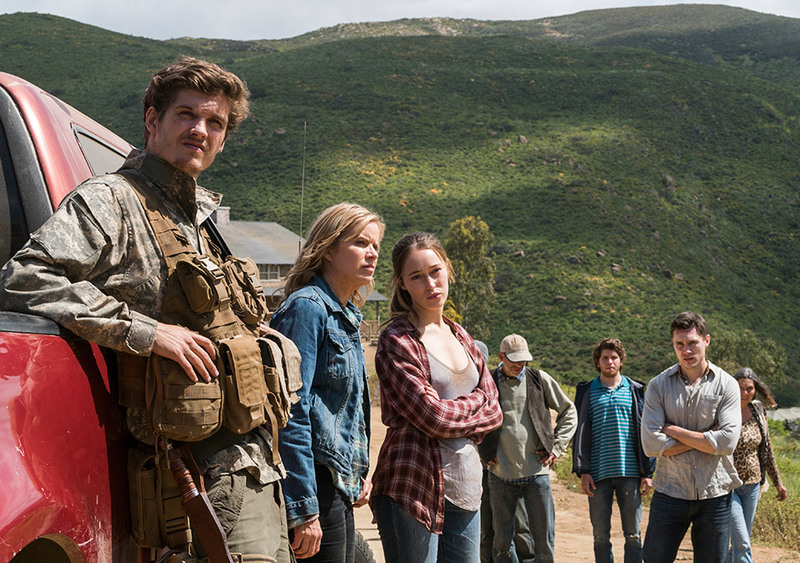 Madison, Alicia and Nick continue to clash with Jeremiah Otto and his doomsday preppers. As a group, these survivalists and their militia seem to be cracking at the seams because Walker, a local Native American, is on a mission to get his land back from the white man. Their never-ending battle has ensnared the Clarks, as well. For eight episodes, Strand has become a side note, although in some sense, he is returning to the ways of being a Fixer, before his character turned a 180 last season. While still not sure how I feel about Walker (he is neither the protagonist, nor the antagonist), there is hope he doesn’t become a stereotype, because that’s the direction the character feels like he’s headed. Surprising myself, I am really enjoying the entire survivalists storyline and can’t wait to find out more about these preppers. I have finally changed my opinion about this series. It may have taken three seasons, but the ancillary stories have really given depth for the main characters (even though I’d like to see more from the webseries characters). Speaking of which, Fear The Walking Dead: Passage recently received two Emmy nominations: for Outstanding Short Form Comedy or Drama Series and Kelsey Scott — who played the role of Sierra — is nominated for Outstanding Actress in a Short Form Comedy or Drama Series (Robert Kirkman’s much-touted sister series, TWD, has yet to attain any award nominations for acting). In addition, Fear The Walking Dead: Flight 462 was also nominated for two Emmys last year in the same categories, with Michelle Ang receiving the Outstanding Actress nomination. The Primetime Emmys will air on Sunday, Sept. 17, while Fear’s Mid-Season Premiere will return to AMC on Sunday, Sept. 10.